We need a good, accurate, Leopard 2A4. There have been attempts in the past from Esci, Heller, Italeri (sometimes reboxed by Revell) and Hobby Boss. So, does this latest release from Revell come up to scratch and improve on the Hobby Boss kit which was the last 2A4 to be released? Disappointingly, no it doesn't. Don't get me wrong. It is an improvement on what has gone before, but this kit (and it's sibling 2A6 kit) leaves room for improvement. The first thing to note is the box. This is an open ended affair and not the more common and practical box with a separate top. It is difficult to get the contents back in and where do you keep your parts after you start construction? 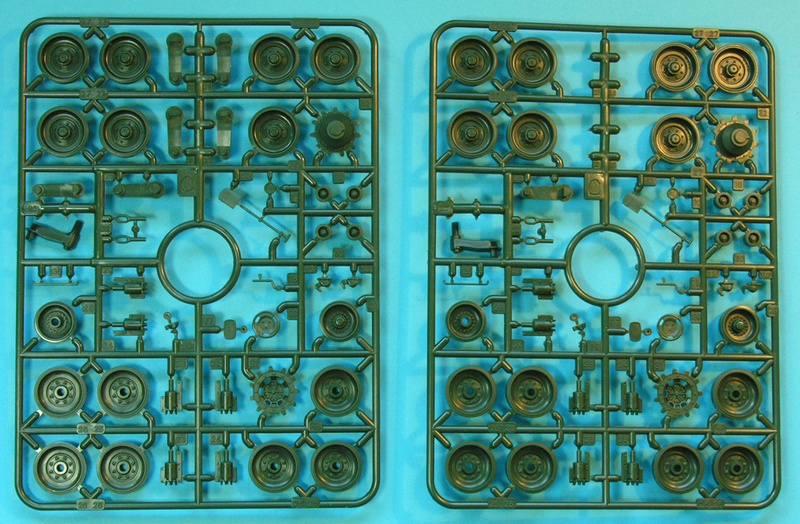 Let's take a quick look at the sprues. First impressions are that there aren't a huge number of parts. This is good as it will make for a fairly quick build out of the box. The hull is not a conventional tub and is built with separate sides, bottom and rear plates. A nice feature is that two internal bulkheads ensure that the angles will be correct and they will also support the hull top. This is a problem with Leopard 2 as the turret is quite big and a common complaint is that the hull top sags when it is mounted, meaning the long turret bustle often touches down on the rear deck. Having the hull sides separate also means that the moulded on suspension mounts and hull side detail is crisp and clear. However, most of this will be invisible with the running gear and skirts in place. The right side hull has a separate panel at the rear that hints at a future version with an APU. The hull top carries a lot of detail but also has the biggest problem for the 'perfectionists' amongst us. At the front there are large non-slip patches that are appropriate for early production vehicles. The panels either side of the access cover are too short and too far to the rear. However, at the rear are small non-slip patches that are only appropriate for later vehicles. As far as I know, there was no interim pattern between the change-over from large to small patches, so this is a big problem. I have checked my references and cannot understand why Revell have done this. All of these points were correct on the previous Revell release (03053 which was an Italeri rebox). They should have looked at their previous kit (an Italeri rebox). On the same sprue is the hull bottom. 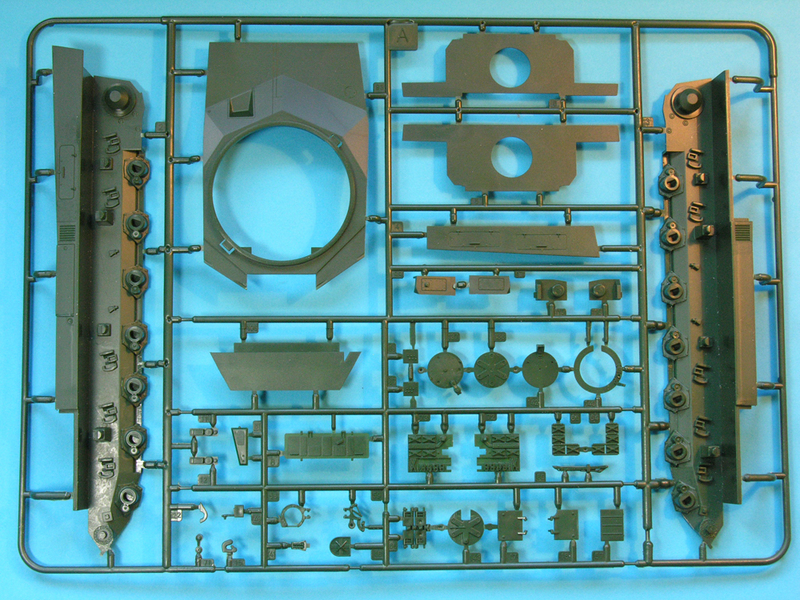 This has three reinforcing strakes which are appropriate for the sibling 2A6 kit, but not for German 2A4s (though KMW did offer it as a factory mod so just a few may have been fitted). They have been added on some export versions for Finland (not covered in this kit's decal options) and Greece (a decal option). 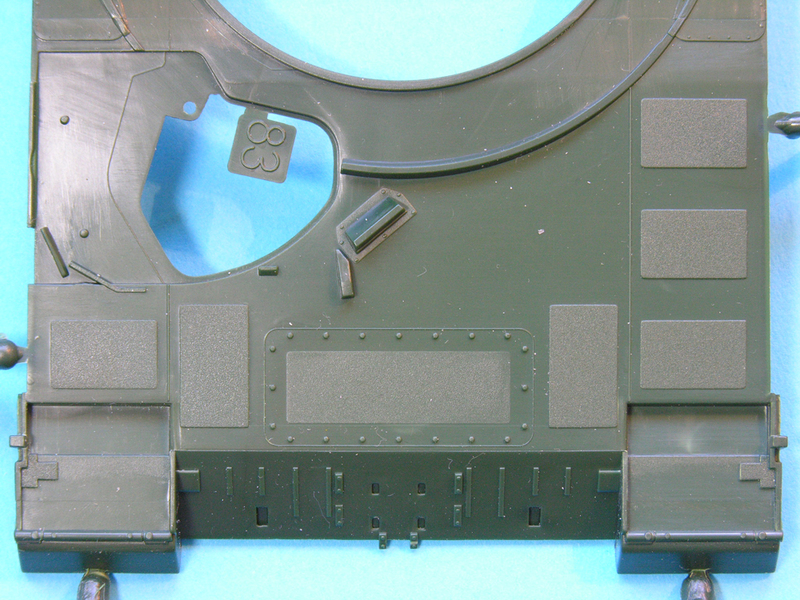 Revell have re-engineered this sprue for the 2A4 hull top from the 2A6, so why didn't they engineer out the three strakes? Another oddity is that the battery door next to the air filter on the right is separate and the one on the left is moulded closed. The circular air filters themselves have strange ribs around the circumference where there should be mesh grilles. All of the tools are moulded separately and the mounting brackets are moulded on the hull top. The tool release clips are also moulded on and could be easily removed and replaced with etch items for a better appearance. The fuel hose and the triangular element of the deck lifting gear is also moulded on. 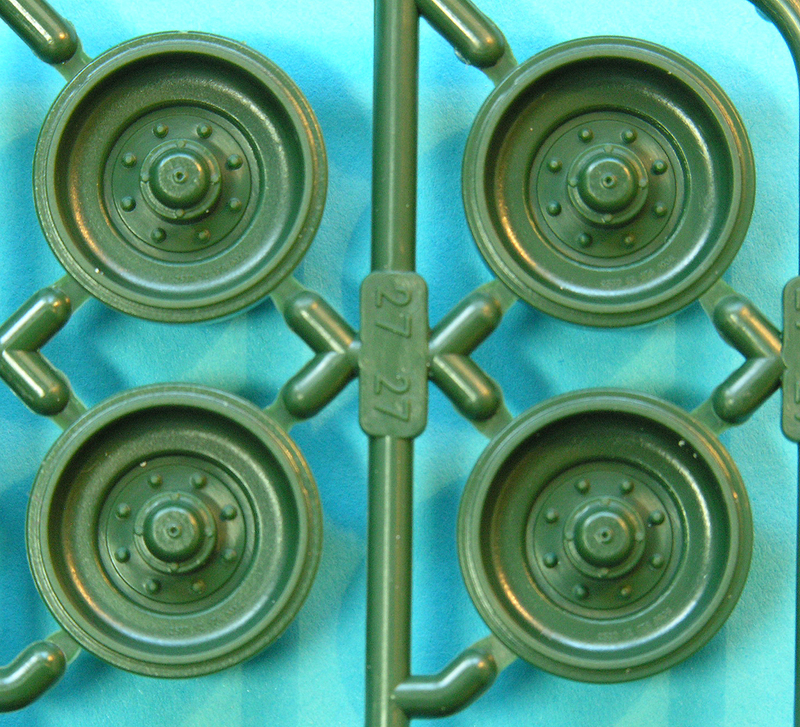 Lifting handles are all moulded solid. The twin deck grilles are nicely rendered with a fine mesh over the radial pattern beneath. On the hull front is an access panel. Originally, this was separate and bolted in place on the real vehicle. Later it was sealed which is replicated here, though the edge should be depressed and not raised. 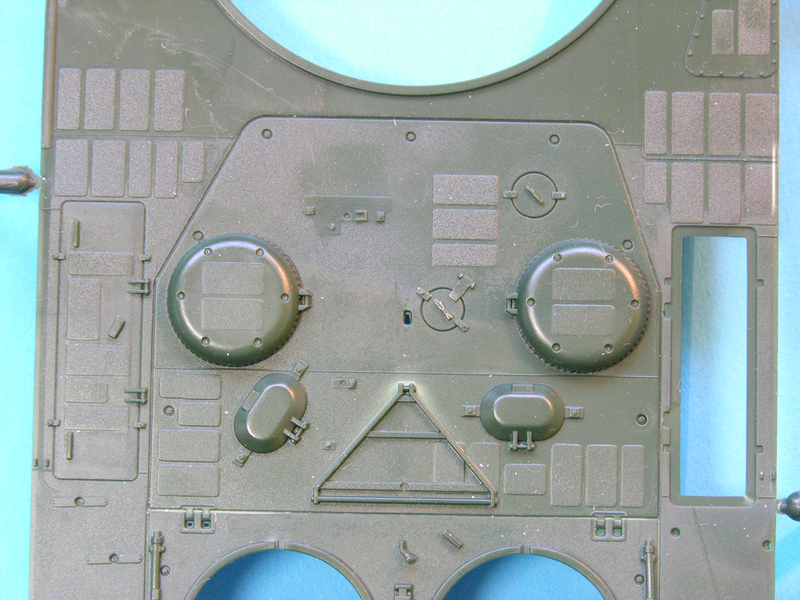 The kit has what looks like rivets - not bolts - around this panel. The same applies to bolts on the hull top panels alongside the turret ring. Again, all of these are correct on their previous 35053 kit. The grille across the rear plate has the correct number of slats (unlike the Hobby Boss kit) but they are not very convincing. They are treated as simple ribs on a flat base and have no depth or dimension to them, totally lacking the impression of being angled downwards. Very disappointing. At least Hobby Boss got this aspect right as did 35053 again! The numerous weld lines on the hull top (and turret) are mostly represented but only as untextured raised lines. The front heavy armoured skirts have detail on the inside so they could be posed in the raised transport position. The thinner rear skirts are on a separate sprue and are quite nice. The turret suffers the same anaemic bolt problem as the hull. They are all treated as small rivets. The front vertical turret faces have mould joints to clean up and the mantlet has a lot of sink marks. The turret bustle stow bin has a moulded-on canvas cover. Hobby Boss has an open bin here, though the part fit wasn't too good. Apart from these points, the turret is actually not too bad. The two cupola rings have tapered edges so they don't look as thick as in previous kits - nice! 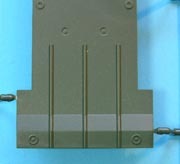 The turret sides are separate parts. The gunner's sight is moulded solid with no clear parts (one of the windows is tinted anyway) and the armoured doors have to be cut if you want to show them open. The rear turret wall - including the angled sides - has everything moulded on. This results in the bolts on the angled sides being moulded in peculiar teardrop shapes. 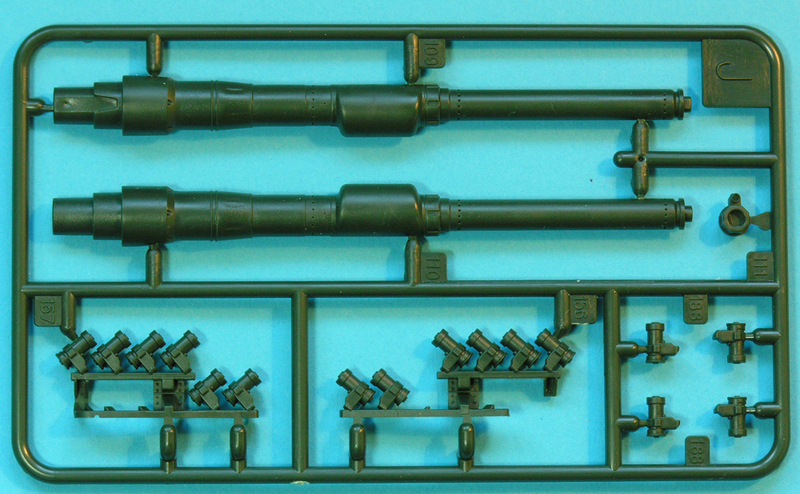 The smoke launchers are moulded as two rails with four launchers on the top rail and two on the bottom, all facing forward, with two more to be added separately. The bottom ones should all be angled, so the moulded on ones are incorrect. The L44 gun is moulded in two halves which means some careful clean-up. 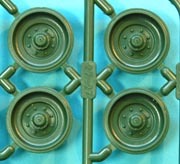 The holes around the barrel are all moulded in one direction meaning they are not all round. 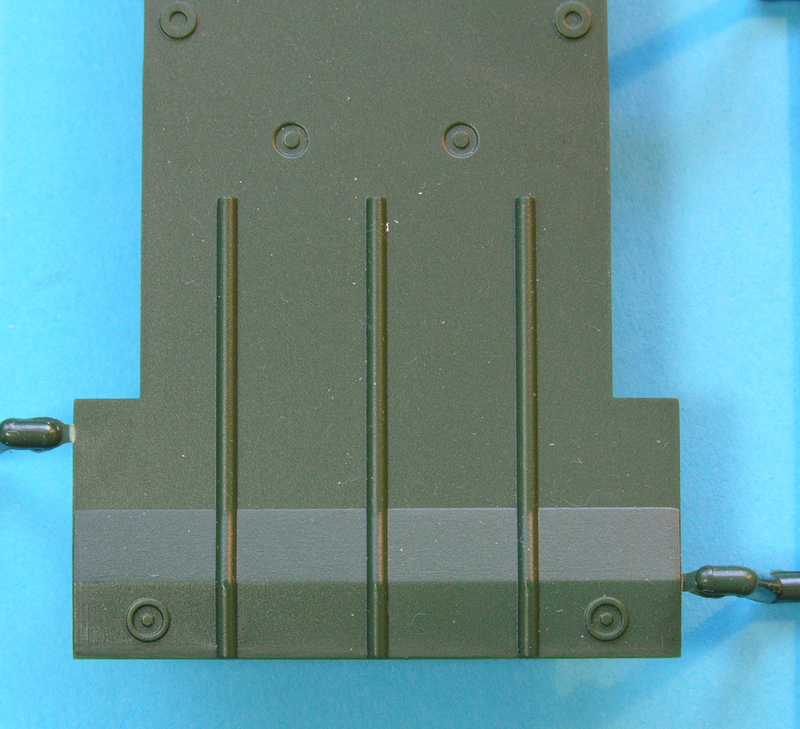 Two gun travel locks are provided - one stowed on the rear deck and one for use around the barrel. 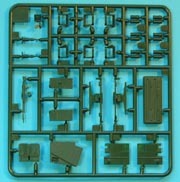 There is a separate sprue for Dutch/Austrian specific versions. This includes an FN machine gun, an ammo box as extra turret-top stowage, different aerial bases and the Dutch pattern smoke launchers. 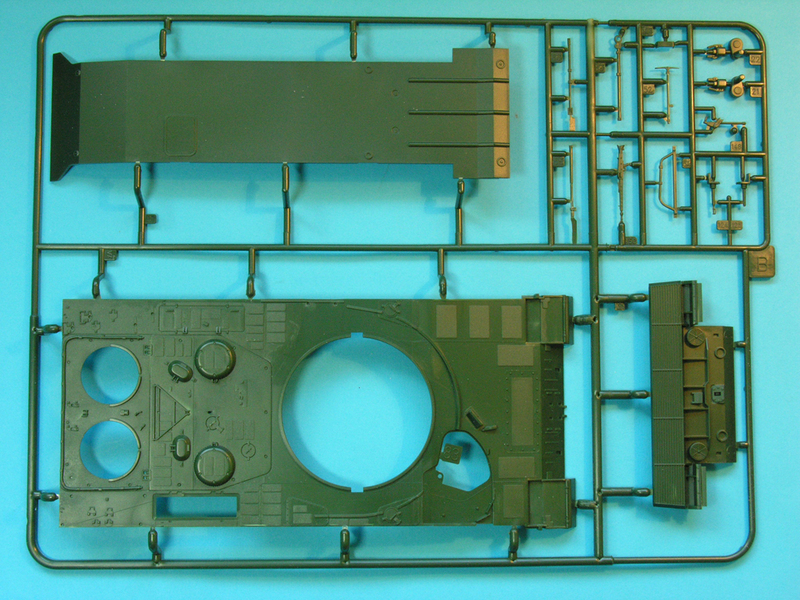 Also on this sprue are parts intended for a 2A5/A6NL - another future kit. 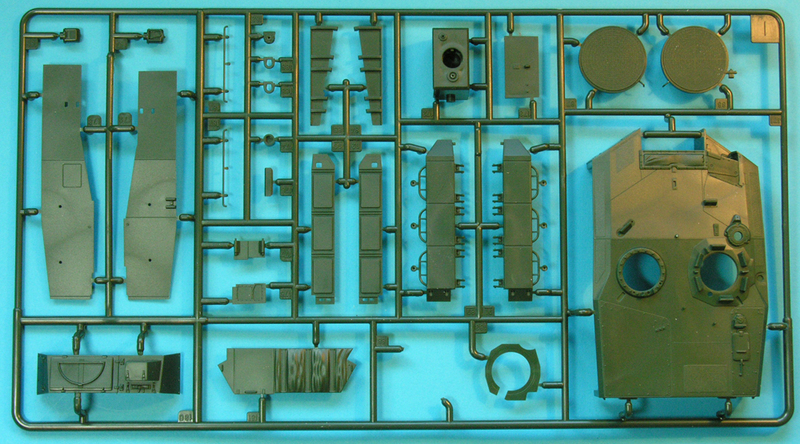 The smoke launchers look nice but lack any of the U-shaped guards or electrical connections that are all obvious features in reality. The best part of this kit is the running gear. The sprockets are very nice and correctly have the 12 mounting bolts which Hobby Boss completely ignored! The road wheels are superb, have detail on the rear faces (most Leopard kits have no detail here at all) and tiny casting numbers on the front faces. 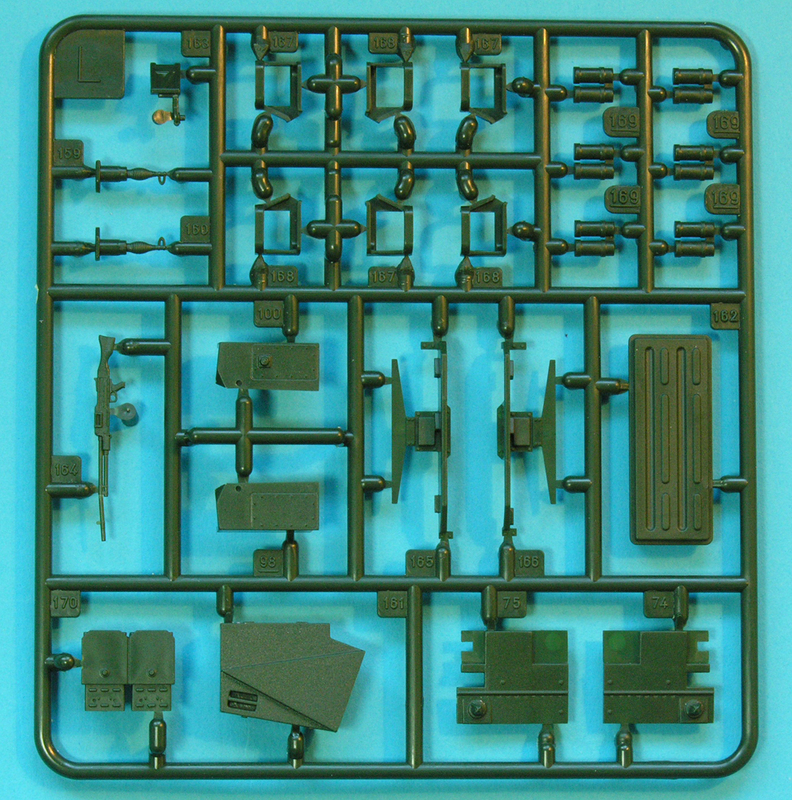 I have seen sprue photos of this kit (and the 2A6 kit with which it shares many parts) on the internet with lots of sink marks on the suspension arms, but my 2A4 kit is thankfully free of them. Rear mud flaps, tow cables and tracks are all moulded in a rubbery vinyl. The cables are best replaced with braided wire. The tracks are in two lengths per side and are quite nicely detailed though do have ejector marks on the inside every 10 links or so though they will mostly be hidden under wheels. Wire for the aerials is taped to the front of the instructions but is not very obvious and is easily bent. 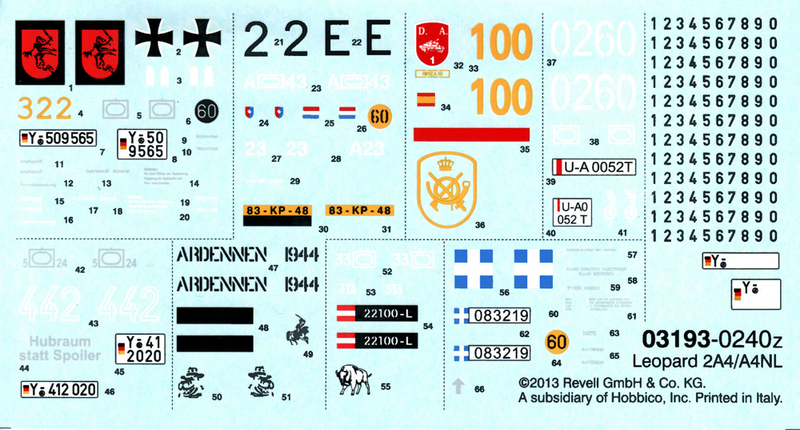 Decals are included for German (two), Dutch, Austrian, Polish, Spanish and Greek versions. A nice addition is warning stencils for the various hull top access panels. The conclusion: I stand by my opening comment. We need a good, accurate, Leopard 2A4. A good after-market set will improve this kit greatly (Inside the Armour are working on a 2A4 set similar to the one reviewed here), but the basic kit needs some work. Why has this VERY important tank not received the attention it deserves as a modern well-engineered injection-moulded kit? Only the manufacturers can answer this but unfortunately most of them are blind to the importance of one of the most numerous Western tanks on the planet. I am sorry to be so critical but if a company is going to the expense of a new-tooled kit, why don't they spend more time on accurate research, design and tooling? Why don't they even look at their previous kit of the same subject which has better detail on some parts? This kit is disappointing but in some respects it is an improvement on the previous Revell release and also on the Hobby Boss kit, though that kit also has its good points. 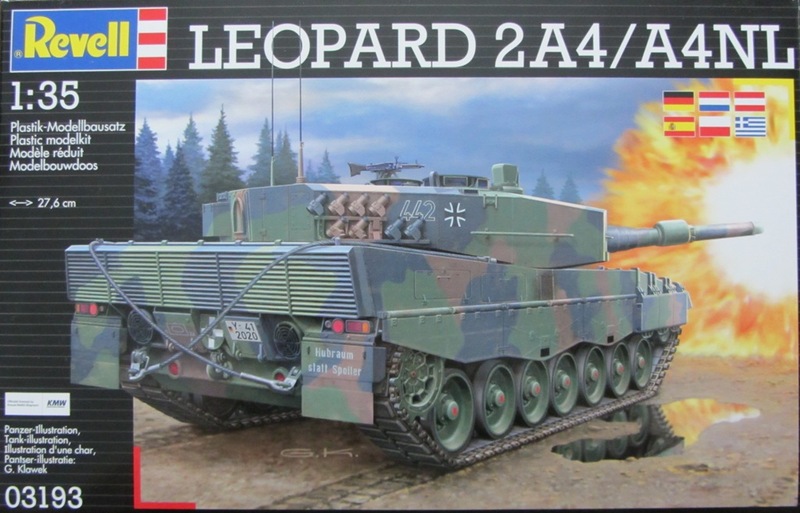 The only Leopard 2 kits worth looking at are the 2A5 and 2A6 from Tamiya. For the true Leopard fan, not the casual buyer, nothing else comes close. Come on Tamiya - give us a 2A4!